It’s no secret that we put on different faces in the various aspects of daily life. I’m not the same guy at work that I am with friends. That’s doesn’t mean that we’re putting on a sham for co-workers. Instead, it gives a reminder that certain personality traits come out in each circumstance. In the right situation, even the most reserved person can feel like the life of the party. These moments could be fleeting, but they remind us that hidden beneath our normal tendencies is a separate person. This doppelganger may look like us, but the actions changes dramatically and generate completely different reactions from others. What if that person actually existed? Could we live in harmony with them? I expect that most of us would go mad by watching this less reserved person take charge of our lives. Richard Ayoade (Submarine) captures this scenario in his latest film The Double. Adapted from a Dostoyevsky novella of the same name, this mind-bending story offers no clear explanation and sends us headlong into the mouth of madness. Simon James (Jesse Eisenberg) is an awkward guy who can barely mutter a word in most social situations. He’s in love with his co-worker Hannah (Mia Wasikowska), yet he can’t even say a clear sentence to her. She lives next door, so Simon’s reduced to watching her creepily from a telescope through his window. Life is not good. The guard at the check-in desk never recognizes him, and he’s dropped off the list at a company party. The arrival of James Simon (his double) initially seems like a good thing. He gives Simon tips on being more outgoing and lets him masquerade as him on a date with Hannah. This excitement is short-lived. James has no scruples, and it’s really easy to make Simon do anything. When his life keeps getting worse, there may be only one escape route. Richard Ayaoade is only 37, but his movies bear the distinctive style of someone much further into their career. After building a solid resume as an actor on shows like The IT Crowd, he’s revealed good promise as a director. His debut Submarine breaks down in its final act, but its look and offbeat humor are distinctive. 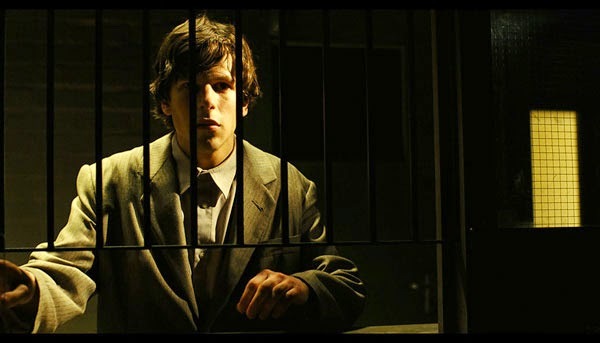 The Double inspires a claustrophobic feeling of a world gone mad that comes closest to Brazil. Even before James arrived, this office was hell. The sets don’t resemble anything in our world, and even the heating ducts seem alive. The excitement from this fresh environment drives the opening act before the plot even kicks into gear. This approach is going to alienate some viewers, however. A resistance to quirkiness may leave you scrambling for the exits. It’s interesting to note how much the supporting characters lack personalities beyond their connections to Simon and James. Their boss Mr. Papadopoulos (Wallace Shawn) can’t even learn Simon’s name and loves James, and there’s little more to see. His daughter Melanie (Yasmin Page) is an angry teen with a one-note personality, and even Hannah’s emotions are controlled by her encounters with the two guys. Other characters feel like actors from The Truman Show and show little sympathy for anything that Simon says. He’s essentially living out a nightmare where no one understands his words or cares enough to consider their meaning. It’s a dark and dreary existence that just keeps getting worse. There are challenges with caring for Simon because he’s such a non-entity; we don’t get the sense he’s about to break out of his shell. James is also such a jerk that he deserves whatever comes to him. 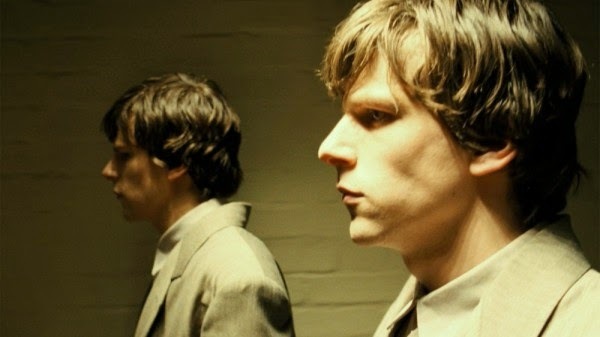 Jesse Eisenberg is the right actor to play both roles because he can depict either side well. His looks would normally get him type cast as a dorky guy, and he’s played that role. On the other hand, Eisenberg can sell the arrogance of a know-it-all who realizes there are no intellectual competitors. That’s the reason he isn’t a bad choice to play Lex Luthor. Eisenberg does the heavy lifting in every scene, and it’s nearly a one man show for much of the story. Ayoade finds the right guy to sell a tricky premise that only works if we’re invested in reaching the conclusion. The resolution introduces new questions, but this never feels like a story that would have a closed ending. The mystery is secondary, and we can only guess about where Simon is heading with his fractured mind. Intriguing. 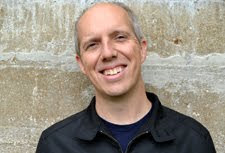 I'm always up for an Esienberg performance, can't wait to see him play Lex! Off to NF to add this to the queue. Thanks. I'm interested to see what Eisenberg does with Lex Luther, but I'm not so sure about the movie on the whole. It seems to be suffering from the Amazing Spider-man 2 syndrome. The Double has received some pretty divided reactions, but you should definitely check it out!